Groups booking more than 10 guests are required to pay the total cost of the booking in advance. If cancelled or modified up to 15 days before the date of arrival, no fee will be charged. If canceled or modified later or in case of no-show, 90% of the reservation will be charged. 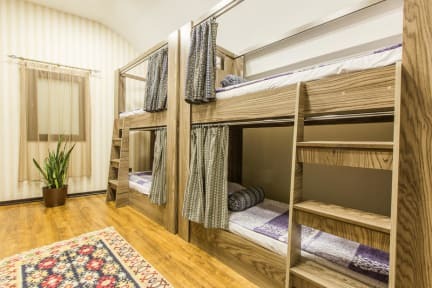 Salam Hostel Baku is located in a city historical center - Old City, near the Four Seasons hotel, within walking distance of one of the main city attraction – Maiden Tower. It is easy access from the Neftchilar Avenue (entrance in the yard, near the roadway gate). Leaving the hostel you may see a beautiful view of Baku Boulevard. Shops, cafes, restaurants, museums and Azerbaijan State Philharmonic under the name of Muslim Magomayev are near the hostel as well. Bus and metro stations are not far from the hostel.